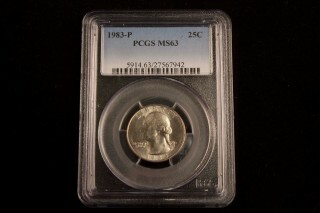 1982 and 1983 Washington quarters should be high on your list of coins to look for when you check your change. Why's that? Because they are worth several times more than face value. True, there are hundreds of millions of these coins around, and heavily well-worn or damaged specimens are plentiful and aren't really worth anything more than 25 cents. However, 1982 and 1983 quarters grading Extremely Fine 40 or better (especially uncirculated examples) are worth premiums over face value, and the reason is quite simple: none were offered in official United States uncirculated sets, as none of those mint products were made during those two years due to federal government cutbacks. What's more, a crippling economic recession in the early 1980s dissuaded many people from saving original U.S. Mint rolls and bags of 1982 and 1983 Washington quarters, leaving relatively few uncirculated examples available. This leaves collectors with few options for obtaining uncirculated 1982 and 1983 Washington quarters. Yes, Mint State quarters from that period are available, but only for a premium. 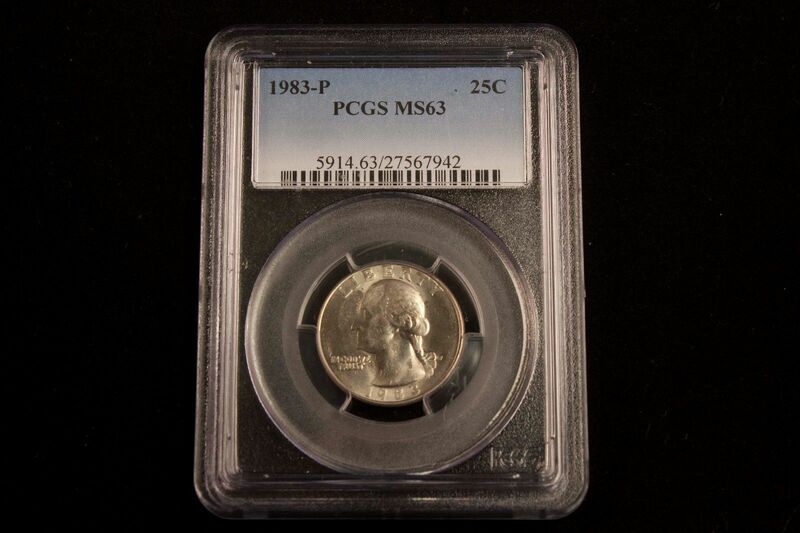 High-end circulated specimens, meanwhile, are equally difficult to locate because most of these coins circulated heavily when they were first released. Not only are 1982 and 1983 Washington quarters worth huge premiums in the grade of Mint State-63, but they are also worth multiples of their face value in well-preserved circulated condition. Doesn't it make you wish you had purchased U.S. Mint rolls and bags of 1982 and 1983 Washington quarters way back when? I know I certainly do! Thankfully, circulated 1982 and 1983 quarters are still available in pocket change and can be found in decent condition with enough searching. I've found several of these coins and have made nice profits by selling them to my coin dealer. Imagine turning 25 cents into $2, $3, $4 – even $6 or more in a matter of moments. So, yes – when people claim there's nothing worth looking for in circulation these days, show them the 1982 and 1983 Washington quarter prices above. While the era of finding Indian Head cents, Buffalo nickels, and 90 percent silver coins in pocket change may be long behind us, there are still plenty of great coins for today's generation to find and enjoy in circulation. Keep on checking your change! Thanks for the feedback I just recently stared a small collection which I've posted photos of. So hopefully one day the'll come in handy for me. Glad you enjoyed the article, Estella. Don't forget to post in the forum if you have any questions about coins: https://coinvalues.com/forum. The community area is more dedicated to banter between members. I have two rolls, $10 each, of 1982 p quarters. They all look practically brand new. All lettering, numbers, design, and edges are still sharp and on point. After reading this very helpful article they will be well worth keeping. Yes, definitely worth keeping. In mint condition each roll could be worth up to $100! I got a 1982 only copper on both side no nickel at all plus punch error on mint mark? Mint mark look like D?